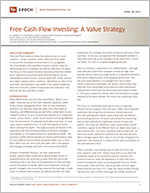 Free-Cash-Flow Investing: A Value Strategy - Epoch Investment Partners, Inc.
Free-cash-ﬂow investors follow the same process as value investors. Using a valuation metric (free-cash-ﬂow yield) to narrow the investable universe down to a manageable list of candidates, free-cash-ﬂow investors uncover value by determining which companies are efficient allocators of capital. This focus on the capital allocation decisions of the ﬁrm instead of on traditional accounting-based ﬁnancial metrics can be interpreted as what we term “passive style drift” under unusual and highly volatile market conditions. We believe an alternative systematic risk framework, grounded in the capital budgeting decisions of the ﬁrm, better encapsulates the systematic risks faced by the free-cash-ﬂow investor. What differentiates you from the competition? What is your edge? These are two of the most important questions asked of any money management ﬁrm. After all, the investment business is an odd one: there are really only a few styles of investing and differentiating yourself, often comes down to just “outperformance” or, as it is commonly referred to in investment circles, “active return.” Active return results from being different from the benchmark. It comprises both alpha and beta. In most cases, beta is expected to be 1.0, with the majority of active return coming from alpha. This edge is usually attributed to the experience and stock-picking prowess of portfolio managers and analysts, or the sophistication of a quantitative model. The quandary is that without decades of historical performance data, it is very difficult to prove these assertions either true or false. More often than not, one is left with faith: faith in the people who manage a strategy and faith in the process they follow. At Epoch Investment Partners, we have experienced people, sophisticated models and a demonstrated record of outperformance; but what sets us apart from the rest of the investing world is our focus on the generation of free cash ﬂow and the allocation of capital. While most traditional value and growth managers use accounting measures like earnings or book value to underpin their process, we believe that the true value proposition of a company lies within its sources and uses of free cash ﬂow. In this way, we approach the investment problem in much the same way as the managers of the very ﬁrms in which we invest. It is akin to a capital budgeting decision. There is, however, a downside to our differentiation. Although asset allocators want their managers to have an edge, they become nervous when this edge results in a signiﬁcant deviation from factor characteristics of the assigned benchmark. The job of an asset allocator is to manage their own or their clients’ exposure to systematic risk factors, which means that they feel most comfortable when beta and other benchmark characteristics trend with the benchmark while alpha exceeds it. This goal is easiest to achieve when the investment manager retained by the asset allocator ﬁts nicely into a particular style box. This focus on investment styles has its roots in Fama and French’s series of papers1 from the early 1990s, which separate systematic risk along three dimensions: market exposure, size, and value/growth (where value and growth are deﬁned by accounting metrics). At Epoch, we eschew the accounting metrics that underpin the traditional notions of value and growth. Our style can, therefore, under extraordinary market conditions, appear to be different from our stated value style: a phenomenon that, over time, manifests itself as style drift. As previously noted, style drift is anathema to the asset allocator. When managers game their style box by actively changing their systematic risk exposures, it confounds the style expectations at the asset allocation level. There is another, more benign type of style drift which we term “passive” style drift. Passive style drift occurs when the systematic biases of an investment process combine with extreme events to cause the appearance of style drift when viewed through the classic accounting-based nine-box model. An example is the drift from value to growth and back again experienced by the Epoch U.S. Large Cap Value portfolio during the ﬁnancial crisis of 2007/8 through the market recovery of 2009/10. Our process of investing in companies with robust free cash ﬂow, efficient allocation of capital, and transparent business models gives us a natural bias against owning the equities of banks and certain other ﬁnancial entities that largely drove returns in the value benchmarks during the crisis and recovery. These value stocks became value traps, ensnaring many a manager and making those who did not own them look less like value and more like growth. Interestingly, an alternative systematic risk framework2 has recently been proposed that decomposes risk more along the lines of the capital allocation framework that we use at Epoch. This production or supply-side model posits the use of market, investment, and return-on-assets factors as an attractive alternative to the classic Fama-French model. In this framework, this is akin to changing coordinate systems in risk space, our U.S. Large Cap Value portfolio as an example has consistent systematic risk exposures that very closely match our investment philosophy. Although there are many styles of investing, all share two characteristics. First, an investor must decide upon which systematic risk factors they wish to emphasize and second, they must earn their keep by adding alpha or returns in addition to the systematic factor bets they have assumed. The Epoch style of investing is to invest in companies that are efficient allocators of capital. We reﬁne this process by seeking those superior allocators of capital who have large free cash ﬂows relative to their market capitalizations. Such companies are commonly said to have a high Free-Cash-Flow Yield. The more opportunities good allocators have to allocate capital, the more valuable they are to those who invest in them. The traditional value investor generates value by his or her ability to separate “good” productive book assets from “garbage” book assets. Similarly, the free-cash-ﬂow investor must be able to discriminate between managements that are good stewards/ allocators of capital and those that misallocate capital. Value is created by investing in the business via internal projects or acquisitions if and only if this results in a return in excess of the cost of capital. When this is not the case, value is created by returning free cash ﬂow to shareholders. In the same way a traditional high B/M (Book Value to Market Value) investor wants to buy a dollar of book value as cheaply as possible, the free-cash-ﬂow investor looks to buy a dollar of free cash ﬂow as cheaply as possible. Thus, the free-cash-ﬂow investor’s process is exactly analogous to the traditional value manager’s process. First, ﬁnd stocks that are attractive based on a valuation metric – FCF yield vs. P/B or P/E – then add alpha by discriminating among inexpensively priced stocks that are likely to be valuable rather than those that are merely cheap. Our application of free-cash-ﬂow investing focuses on our ability to follow a dollar of revenue, or an incremental dollar of new capital, through the business. What are the claims on these dollars as time passes and products are made or services rendered? In terms of understanding how a business actually works, the lens of free-cash-ﬂow analysis is superior to the lens of the accountant with its myriad accruals and assumptions of useful asset lives.4 Our process allows us to more fully understand the drivers of the business and to invest as if we intended to purchase the entire ﬁrm. This process makes us inherently biased against opaque and arcane business models, and it leaves us with a consistent aversion to owning complex companies that are characterized by extensive accruals, off-balance sheet items, and policies that obfuscate the measurement of cash ﬂows (e.g. ﬁnancial entities with many lines of business and immeasurable elements of leverage.) It also means we do not own companies that can “blow up” ﬁnancially such as what happened to many ﬁrms in 2008-2009, particularly in the ﬁnancial sector. At Epoch, we have a consistently applied, value-based investment process that does not rely on the accounting metrics that have come to deﬁne many “style” indices. As a result, our strategy may appear to drift from time to time simply because of extraordinary dynamics within the index. For example, we consider the emergence of a massive weight in ﬁnancials as an extraordinary event in the history of “value” indices. This event induced what appeared to be a style drift in one of our portfolio strategies when viewed through the prism of a classic nine-box style analysis. Consider the trailing 12-month exposures of our U.S. Large Cap Value portfolio for the period 2001-2010. Figure 1 shows that, using a traditional rolling manager-style analysis, the portfolio’s exposure drifted from value to growth and back towards value. Russell 4 style indices. Rolling 12 month windows. Style drift poses a concern for many investors because it implies active drift, in which an institutional money manager switches investment styles to capture returns from whatever style happens to be working at the moment. This type of active drift obfuscates systematic risk exposures at the asset allocation/ plan sponsor level. By contrast, passive drift – as evidenced in the recent performance of our U.S. Large Cap Value portfolio – is much more benign and does not reﬂect a change to the manager’s systematic risk exposures. To further elaborate the distinction between active and passive drift, let’s take a look at Figure 2. This graph allows for a ﬁner decomposition of style exposures by separating the Russell 1000 Value and Growth indices into ﬁnancials and non-ﬁnancials. In this ﬁgure it can be seen that our portfolio’s exposures have been fairly stable over time with only modest ﬂuctuations. The difference between what we see in Figure 1 versus Figure 2 is the result of differences in market capitalization and volatility of the sub-components. At the beginning of 2007, ﬁnancials made up approximately 40% of the market value of the Russell 1000 Value index. Our very low exposure to ﬁnancials combined with the extraordinary volatility of the ﬁnancial sector, therefore, made us appear “non-value” (i.e. growth) in the eyes of any historical analysis that aggregated the value and growth indices instead of separating them. Systematic or style risk is encapsulated nicely in a theoretical sense by the Arbitrage Pricing Theory (APT)5. At an abstract level, APT says that a limited and perhaps small number of systematic factors can explain and account for the majority of cross-sectional equity risk. The shortcoming of APT is that it doesn’t provide much insight into what these common factors might be. A large body of research has been generated in an attempt to address this issue by proposing both fundamental and purely statistical factors. The Fama-French three-factor model that uses the difference in the returns of small-cap stocks vs. large-cap ones, high book-to-market (value) vs. low book-to-market (growth) stocks, and the market return (beta) is one of the more famous and useful iterations of APT. The attraction of the Fama-French model is that the factors it uses to describe/explain equity returns – Value/Growth and Small/Large – operate in alignment with the investing universe’s traditional segmentations. This made it a very popular model and helped pave the way for the nine-style box model, which segments the market into large, mid, and small cap on the one hand, and value, core, and growth on the other. Allocation among boxes in the nine-box model covers an investor’s systematic risks (beta), while the choice of the manager within each box provides the alpha. While the Fama-French model has been satisfactory in some respects, there are many anomalies it is unable to explain. And since APT does not specify which factors explain the market, it leaves the door open for other factor models to explain returns. Examples include outcomes associated with short-term prior returns, failure probability, earnings surprises, accruals, net stock issues, and stock valuation ratios. Their alternative workhorse model uses the returns from the market portfolio (Beta) and factors based on the returns from a portfolio of low-investment stocks minus the return of a portfolio of high-investment stocks (INV) and the returns from a portfolio of high-ROA stocks minus the return on a portfolio of low-ROA stocks (ROA). Their INV and ROA factors earn signiﬁcant average returns of 0.28% and 0.76% per month, which persist after adjusting for their exposures to the Fama-French factors. They show that their new model outperforms traditional asset pricing models in explaining anomalies such as earnings surprises, total accruals, net stock issues, and asset growth. One interpretation of their success in explaining anomalies is that their model captures more of the systematic risk in the equity market than the Fama-French model. In the elaboration of their model, Chen, Novy-Marx, and Zhang (CNZ) note that investment should predict returns because given expected cash ﬂows, a high cost of capital implies a low net present value of new capital and therefore lower investment, whereas a low cost of capital implies a high net present value of new capital and therefore higher investment. Similarly, return on assets (ROA) predicts returns because high (low) expected ROA relative to low (high) investment implies high (low) discount rates. This is because high (low) discount rates are necessary to offset the high (low) expected ROA and induce low (high) net present values of new capital and therefore low (high) investment. If the discount rate was not high (low) enough to offset the high (low) expected ROA, ﬁrms would observe high (low) net present values of new capital and invest more (less). PV = FCF0 + FCF1 /r + TV/r. r = (Expected proﬁtability +1) / (Marginal cost of investment). This says that the investment return, deﬁned as the ratio of the marginal beneﬁt of investment in date one divided by the marginal cost of investment in date zero, should equal the ﬁrm’s discount rate. The implications for systematic returns across stocks are that, given an expected ROA, ﬁrms that invest more should have lower expected returns. Additionally, given a level of investment normalized by assets, ﬁrms with higher expected ROA’s should have higher expected returns. The Fama-French and nine-box models approach stock returns from the point of view of an investor allocating risk capital. CNZ’s investment-based model approaches stock returns from the perspective of the ﬁrm itself in the form of its capital allocation problem. To elucidate this difference, Figure 3 shows the risk factor exposures to both the Fama-French and CMZ 3-factor models for the Epoch U.S. Large Cap Value portfolio, the Russell 1000 Value ex-ﬁnancials, and the Russell 1000, core, value, and growth benchmarks. In the traditional Fama-French framework, our portfolio looks very similar to the core Russell 1000. However, when viewed through the lens of the CMZ investment based 3-factor model that more closely resembles our investment process, our portfolio looks much more like the Russell 1000 Value ex-Financials. The p-value is the probability that the associated coefficient is zero. Bold numbers represent p-values that are less than 10%. Figures 4 and 5 expand on this theme and show the similarity of the exposure dynamics of our U.S. Large Cap Value portfolio and the Russell 1000 Value ex-Financials through the recent financial crisis. Figure 5A: Chen, Novy-Marx and Zhang Rolling 24-Month Market Exposure. Unlike most investors, we deploy investment capital in the same way companies conduct capital budgeting exercises. Because of this, there are times we may appear to drift between the traditional style designations of value and growth despite our consistent investment approach. However, it has been shown that, because of our focus on free cash ﬂow, we have been able to ride out the market ﬂuctuations that put so many other money managers in dire straits. A recent study by BofA Merrill Lynch reinforces this point and is reﬂected in Figure 6. Their study identiﬁed three explanatory variables that dominated equity market returns over a 25 year period (free cash ﬂow yield, quality as reﬂected in high ROE ﬁrms, and Beta). In examining the relative contribution of these three variables, we see (1) the dominance of cash ﬂow over time relative to the other two variables and (2) that every speculative rally lead by high Beta stocks has been followed by a period where strategies based on Free-Cash-Flow yield ruled the day. The lesson is that true value is found by investing in ﬁrms with strong free cash ﬂows and efficient capital allocation strategies. Free-cash-ﬂow investors follow the same process as value investors. Using a valuation metric (free-cash-ﬂow yield) to narrow the investable universe down to a manageable list of candidates, value is uncovered in companies that generate signiﬁcant free cash ﬂow and are efficient allocators of capital. This focus on the capital allocation decisions of the ﬁrm instead of traditional accounting-based ﬁnancial metrics can lead to what we term “passive style drift” under unusual and highly volatile market conditions but not the dreaded “active style drift” so properly feared by consultants. We have also tried to show that an alternative systematic risk framework, grounded in the capital budgeting decision process of the ﬁrm, better encapsulates the systematic risks faced by the free-cash-ﬂow investor than the traditional Fama-French Returns based methodology. “Sunlight is the best disinfectant” said Oliver Wendell Holmes, and more sunlight is found through the prism of cash-ﬂow analysis than traditional accounting metrics. 1Fama, Eugene F., and Kenneth R. French, 1992, “The Cross-Section of Expected Stock Returns,“ Journal of Finance 47, 427-465, Fama, Eugene F., and Kenneth R. French, 1996, “Multifactor Explanations of Asset-Pricing Anomalies,“ Journal of Finance 51, 55-84, and others. 2 Chen, Long, Novy-Marx, Robert and Zhang, Lu, An Alternative Three-Factor Model (April 1, 2010). Available at SSRN. 3 See our series of white papers: Financial Services Stocks: The Wheels are Coming Off (August 2005), Financial Services Stocks: The Storm Clouds Gather (November 2006), The Canary in the Coal Mine: Subprime Mortgages, Mortgage- Backed Securities, and the US Housing Bust (April 2007), A Roller Coaster Called Credit (September 2007). 4 See our white paper Mixing Financial Principles with Accounting Standards – A Slippery Slope (August 2005). 5 Ross, Stephen A., 1976, “The Arbitrage Theory of Capital Asset Pricing,” Journal of Economic Theory 13, 341-360. 6 Chen, Long, Novy-Marx, Robert and Zhang, Lu, An Alternative Three-Factor Model (April 1, 2010). Available at SSRN. 7 Cochrane, John H., 1991, “Production-based asset pricing and the link between stock returns and economic fluctuations”, Journal of Finance 46, 572-621.